To trek gorillas you must have a pre-booked gorilla trekking permit in Uganda each costs USD$600 in Rwanda each cost USD750 and DR Congo but Uganda has introduces specially discounted gorilla permits in the month of March April, May and November 2016/2017 to $450 . Since the gorilla parks are located far away from the airport you arrive from you will need transport (4x4 advisable) to reach the park. The drive from Kampala/ Entebbe to Bwindi takes about 8-9 hours. This means that if you are tracking gorillas in Uganda you will need at least 3 days to the gorilla trek: One day travelling to the park, another day tracking the gorilla, and the third day driving back to Kampala or Entebbe. How to book your gorilla permit, you will need to either contact the relevant travel agency to book the gorilla permit Uganda Wildlife Authority for Uganda, RDB for Rwanda and UNESCO for DR Congo or book your permits through a local tour Company like us www.kisorotoursuganda.com or www.gorilla-tracking-uganda-rwanda.com Please note that gorilla permits are only confirmed by paying for them in full. You will need to send money for the permits in full to get your confirmation ad ensure that you take care of the bank charges involved to avoid disappointment. If you intend to travel in high season like June, July August and December 2016/2017, be aware that most days are sold out and you may not be able to get the gorilla permit for the days you wish to travel. There are however some gorilla permits cancellations. These permits are not at the Uganda Wildlife Authority but with local tour agents. Which we can assist our clients to get such permits when contacted. However, for the rest of 2016-2017, there are still plenty of spaces so you can confidently contact us now to book your space there. If you arrange the gorilla permit on your own, please ensure that you pick it from the booking office in Kampala before travelling to Bwindi Impenetrable National Park and Mghinga Gorilla National Park. You must present your gorilla permit and passport on the gorilla tracking day to be allowed on the gorilla trek. In case your permit is booked through a tour agent and you are taking the tour with them you may not necessarily need to think about getting the permit from them but if you are not taking the full gorilla tour with them, consider getting your permit before travelling to Bwindi Impenetrable National Park and Mghinga Gorilla National Park. 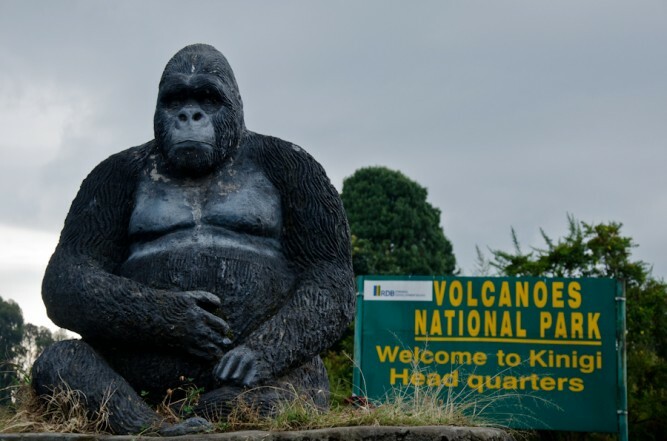 You will require a 4x4 vehicle to go to the gorilla in Uganda’s Bwindi Impenetrable National Park and Mghinga Gorilla National Park, Rwanda’s Volcanoes National Park and DR Congo’s Virunga National Park . You need a 4x4 vehicle to navigate the rough pot-holed roads which often get tourists stuck for hours during rainy seasons. You may be able to hire a vehicle for US$150 per day including vehicle, fuel, guide/driver and allowances costs for the guide/driver. Alternatively you may take public buses to a nearby town but you will have to find a cab (preferably 4x4 and which will costs you $100 a day without gas fuel) to ferry you to the Park and to the hotel. You have to report to the park for registration office at 7:30AM. So whatever method you choose, make sure that it is reliable, if you don’t turn up at the appointed time you risk invalidating your gorilla tracking permit and having to pay again. The gorilla tracking time is very unpredictable and you may as well take from 2-9 hours. So have your accommodation booked for the night after your trek as well. For this same reason also have with you a packed lunch for the day, plenty of drinking water, rainproof clothing (you are trekking through a rainforest and any time it can rain). In Uganda, the accommodation you choose will depend on the gorilla permit you book being that the available 15 gorilla families that tourists visit in Bwindi Impenetrable National Park and Mghinga Gorilla National Park range over a wide area. Please contact us for more details about which accommodation you will need to book for each different gorilla family in Bwindi Impenetrable National Park. There are porters for hire (at $15 each) at the park offices and a walking stick is free. Do not overestimate your strength; you may certainly need either or both of these. So consideration to hire one. It’s another way of giving back to the communities. Can I book a gorilla permit without booking a tour?